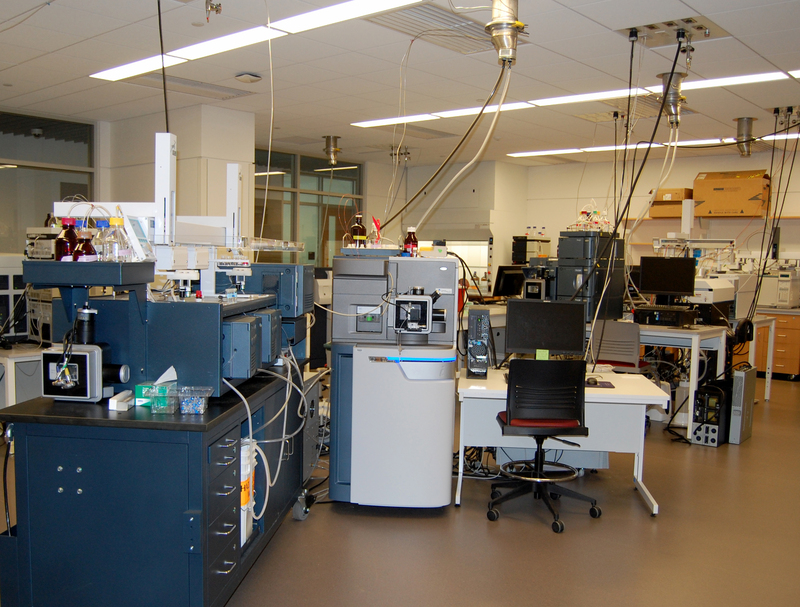 Located on the 5th floor in the Life Science Laboratories the Mass Spectrometry Core houses a suite of state-of-the-art instrumentation for characterizing elements and compounds across the entire mass range from small (metal ions) to large (macromolecular assemblies). 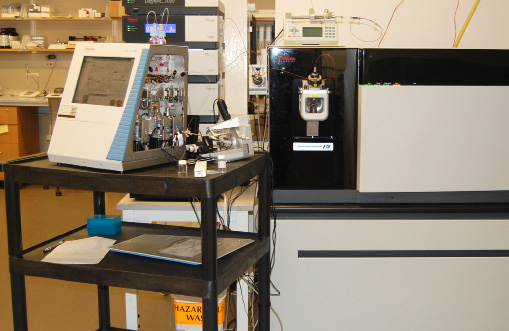 Specialized mass spectrometers encompass a variety of ionization techniques and separation devices to cover a wide range of analytical capabilities. The facility accepts samples and will perform requested analysis. We offer training to users to conduct experimentation for use on a fee for service basis to both internal and external researchers, academic or industry based. Following an initial consultation, covering experimental parameters training and access is arranged through the director. 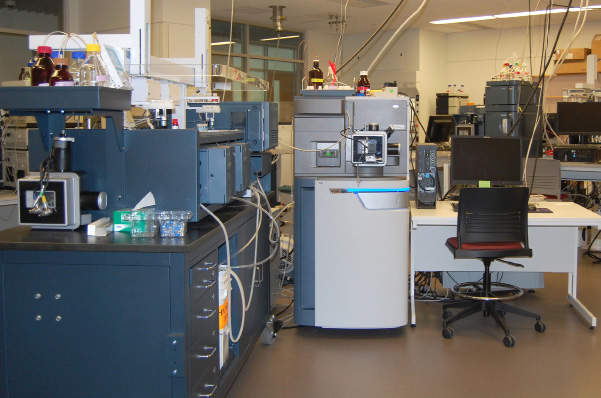 Inductively coupled plasma mass spectrometry enables sensitive simultaneous quantitative measurement of most metals and many non-metals in a variety of samples, including biological matrices. Examples include environmental analysis (water contamination), metals in biological tissues and fluids, quantitation of metals in plant material. Quantitation levels in the sub-part per billion range can be achieved for the majority of elements. Laser ablation is also available for spatial imaging of metals in tissues and other sample types. HPLC can also be coupled for quantitative measurement of metal speciation. 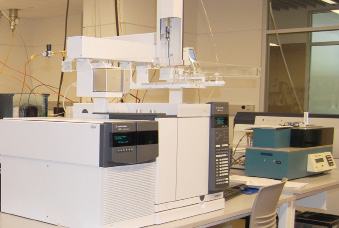 Gas chromatography is a powerful tool for separation of volatile small molecule analytes. Samples are volatilized in the injector and then separate based on hydrophobicity and boiling point in the GC column, followed by mass determination in the MS. Results can be searched against the NIST MS libraries to identify compounds. Coupled to triple quadrupole mass spectrometry this enables quantitation of e.g. metabolites. 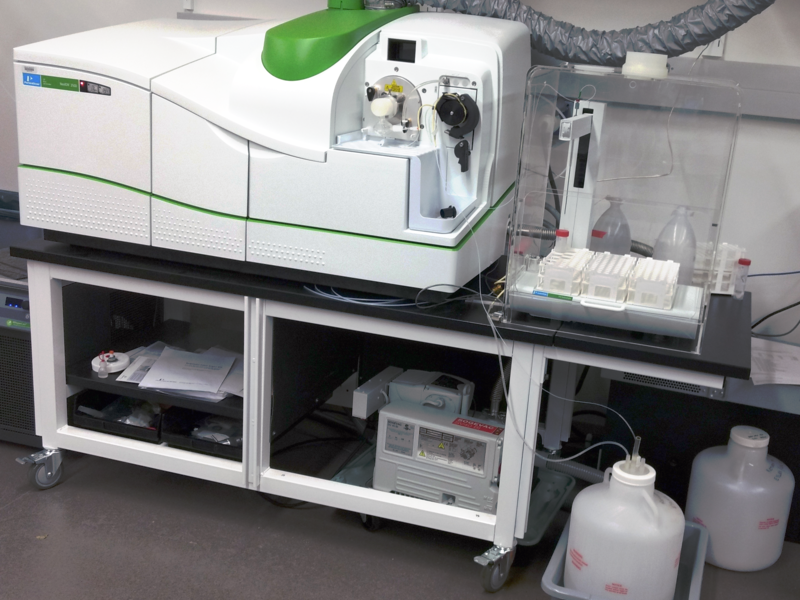 Robotic auto-sampler can perform normal liquid-phase sample injection as well as headspace and SPME pretreatments. 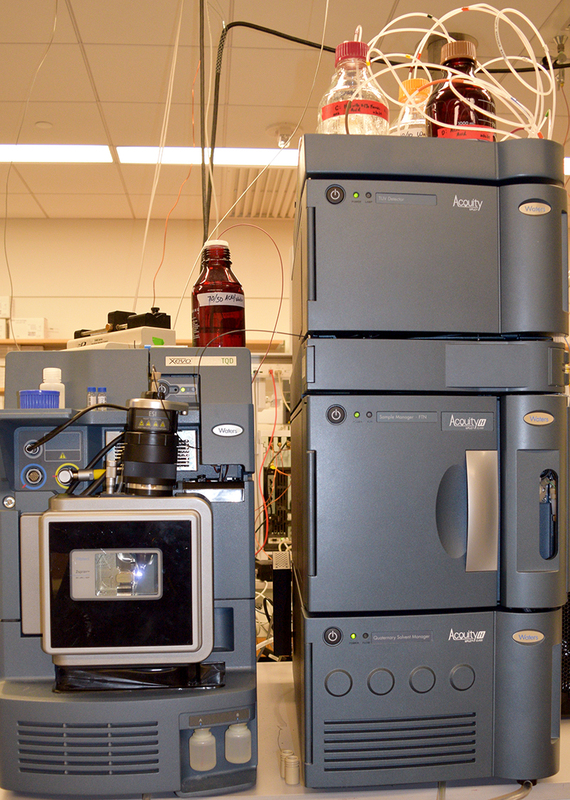 Tandem quadrupole mass spectrometer coupled to UPLC rapid separation of complex mixtures. Separation and quantitation of a broad range of small molecules from metabolites to peptides. UPLC for separation of compounds at high resolution due to small stationary phase particle size. High sensitivity and selectivity of triple quadrupole enables quantitation at low levels even in a complex matrix background. Multi-mode ESCI ion source allows simultaneous ESI and APCI modes of ionization, together with rapid polarity switching for maximal compound detection. >1000 MRMs can be monitored per sample run for quantitation, with optional triggered full scan for compound confirmation and spectral interference determination. Q-TOF instruments have a wide range of capabilities for characterization of small and large biomolecules. Ion mobility separation capabilities add an orthogonal separation based on gas-phase collisional cross-section (CCS). This instrument is primarily used in two modes, namely nanospray ionization for measurement of proteins under native conditions. IMS can be employed to measure changes in CCS in response to e.g. ligand binding or oligomerization state. Hydrogen-deuterium exchange is a powerful technique for measurement of protein-protein, protein-ligand interactions and protein dynamics. HDX automation enables experiments to be performed in an automated and highly reproducible fashion. Adding IMS enables complex mixtures of peptides to be separated in the HDX system based on HPLC elution time, gas phase structure, and peptide molecular weight. This orthogonal separation increases peak capacity for HDX measurement, allowing for more confident identification and deuterium uptake measurement, leading to increased protein coverage. State of the art MALDI-TOF instrument for high sensitivity measurement of limited sample quantity (routinely low fmol amounts). 2 kHz laser repetition rate (1 kHz in TOF/TOF mode) enables very rapid data acquisition at high resolution and mass accuracy. Smartbeam IITM laser technology enables focus to 10 μm for high resolution spatial imaging applications. Applications include rapid top-down sequence confirmation of biopharmaceuticals, high speed tissue imaging for biodistribution and biomarker discovery, proteomics and glycoproteomics. LC-MALDI capabilities for high sensitivity measurement and offline interrogation of samples at greater depth than conventional online LC-MS proteomics. This instrument combines supremely high sensitivity with high resolution and high mass accuracy to probe complex sample mixtures. 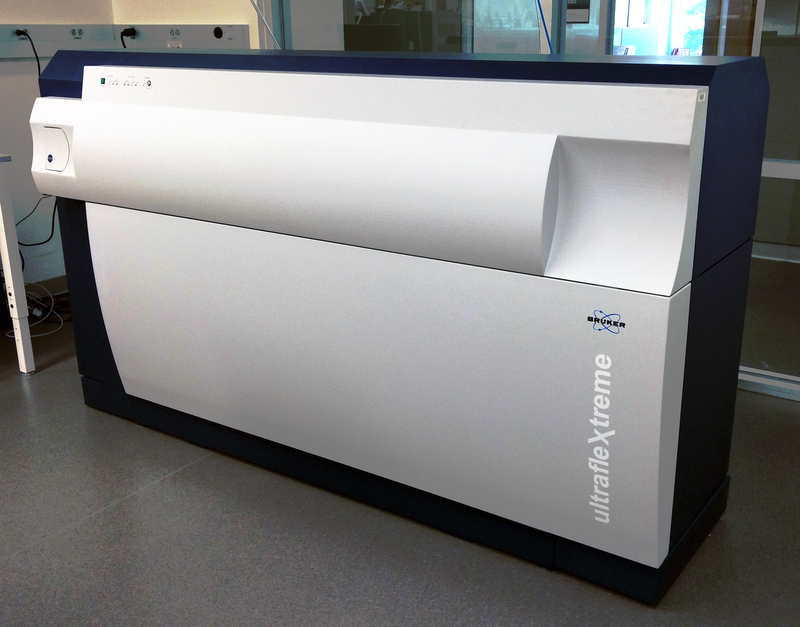 Combined with Ultimate 3000 RSLC or Easy nLC 1000 nanoLC systems for metabolomics or proteomics workflows. The Orbitrap Fusion tribrid mass spectrometer combines the best of quadrupole, orbitrap, and ion trap mass analysis in a revolutionary architecture that delivers unprecedented depth of analysis. It enables life scientists analyzing even the most challenging low-abundance, high-complexity, or difficult samples to identify more compounds more quickly, quantify more accurately, and elucidate structures more thoroughly. Steve has been Director of the Mass Spectrometry Core Facility at UMass Amherst since 2000. He has been involved in mass spectrometry and other biophysical and analytical techniques since grad school, working on developing novel methodologies to study biomolecular structure and dynamics. He has co-authored a book on Mass Spectrometry in Biophysics. Steve holds an undergraduate degree and D.Phil. in Chemistry from the University of Oxford. Make a payment to the Mass Spectrometry Facility.